Did you know that the more weight you have around your midsection, the more likely you are to have a higher risk of heart disease? My stomach is the largest part of my body (fat wise). As a petite gal, my stomach has never been flat ever. And with several of the pounds that I have lost over the years, my stomach seems to stay around. The problem with this is that the more fat you carry around your waist, the more fat there is surrounding your vital organs like your HEART. But before you jump on the latest ab machine, its important to know your waist-to-hip ratio and your body shape. The “ideal” ratio is .7 but the recommended ratio is below 0.8 –> I already know that I should lose an inch or two. The World Health Organization (WHO) along with several medical journals strongly suggests keeping your waist below 31 inches for lower health risks (for women). If this doesn’t sound familiar, think of all of your female family members who may have any of these conditions and take a look at their bodies. From my experience more then 80% have a waist larger than 31 inches. 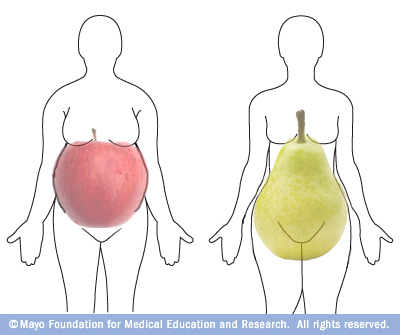 Its not about getting a flat stomach, but more so reducing the width around your organs to protect your health. So how do you change your body regardless of shape? The most important changes should be DIET. Physical activity is important as well, its okay to take small steps to increase your physical activity. I will discuss some tips to whittle your waist in upcoming posts. I have taken new steps to making changes to my diet that I hope will get me to my “waist goals”. I am on a new diet which I will share soon. Its easy and I truly believe anyone can make small changes to improve their health. I will put the proof/pictures where my mouth is to prove small changes work! Look out for it! I will be embarrassing myself soon with pictures of some of the changes I have done to my body, hopefully to inspire those of you to get fit. Do you have the audacity to lose inches for your health?